and Military Cases from CASES, USA. Hardigg is the world’s largest manufacturer of rotationally molded shipping cases. We are justifiably proud of our reputation as the premier engineer and maker of transport containers that protect your equipment in any adverse conditions. We have an array of molded reusable containers: Single and FlangeMounts Lids, Double-Entry Rack-Mounted (including Mobile Workstations), ProRack, and Customized (including deck versions). Our commitment to excellence is evident in every case feature and option. We design all our cases to offer maximum protection during transportation. For example, we exceed ATA compliance - that’s our standard, not an ‘option.’ Our EIA cases are state-of-the-art, and our MIL-SPEC models are designed for maximum life cycle value. 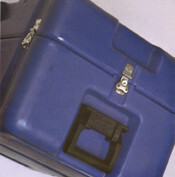 Your computer, medical, ordnance, testing, audio, and electronic equipment is safe and secure in a Hardigg case.